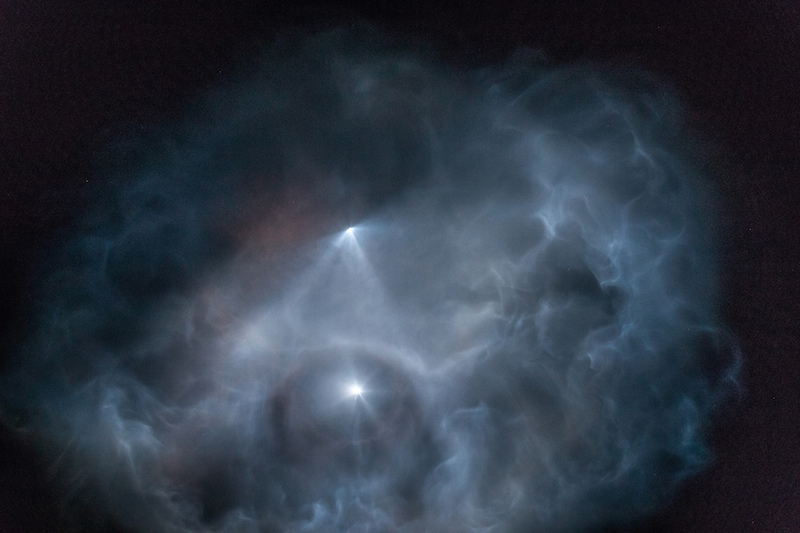 The rocket’s comet-like appearance in the skies over Southern California prompted countless social media posts, with spectators sharing imagery of a bulbous exhaust cloud created by Falcon 9’s first and second stage engines. The engines on each stage were firing simultaneously as one part of the launcher headed into orbit over the Pacific Ocean, and the first stage steered back toward the coast. Three of the first stage engines reignited again after the “boost-back” burn to brake for landing, and the booster’s center engine fired moments before touchdown at Landing Zone 4, located a quarter-mile (400 meters) from the Falcon 9’s launch pad at Vandenberg. The Falcon 9 settled back on its concrete landing pad, emblazoned with a stylized “X” in the center, less than eight minutes after liftoff. 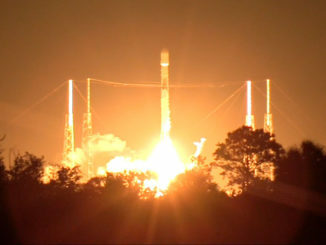 “Vandenberg, LZ 4, the Falcon has landed,” a member of SpaceX’s launch team announced as the booster returned to Earth. Meanwhile, the Falcon 9’s second stage accelerated into orbit with the thrust from its single Merlin engine. The rocket’s nose cone jettisoned once the rocket climbed above the boundary of space, and SpaceX did not attempt to recover the fairing on Sunday night’s mission. The rocket released Argentina’s SAOCOM 1A radar observation satellite just shy of the 13-minute mark in the mission. 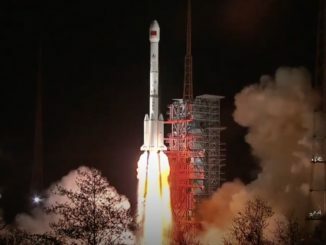 U.S. military tracking data indicated SAOCOM 1A was orbiting around 385 miles above Earth, following a polar orbit track inclined 97.9 degrees to the equator, close to pre-flight targets. The successful launch Sunday was SpaceX’s 17th mission of the year, and SpaceX’s fifth launch from Vandenberg in 2018. 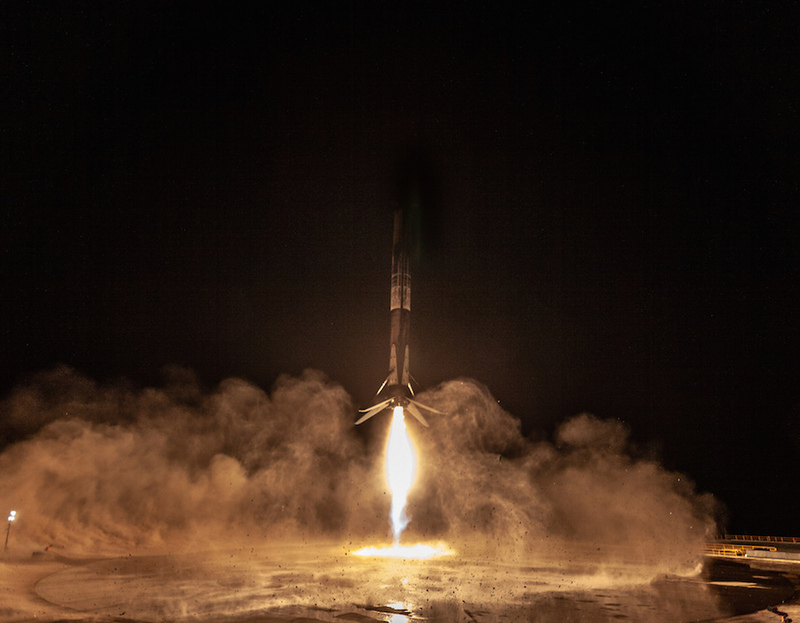 With Sunday night’s mission, SpaceX has recovered one of its first stage boosters 30 times, a tally which includes 18 landings on drone ships at sea, 11 returns to Cape Canaveral, and now one landing at at Vandenberg Air Force Base. The launch of SAOCOM 1A also marked the 16th time SpaceX has reused a Falcon 9 booster. 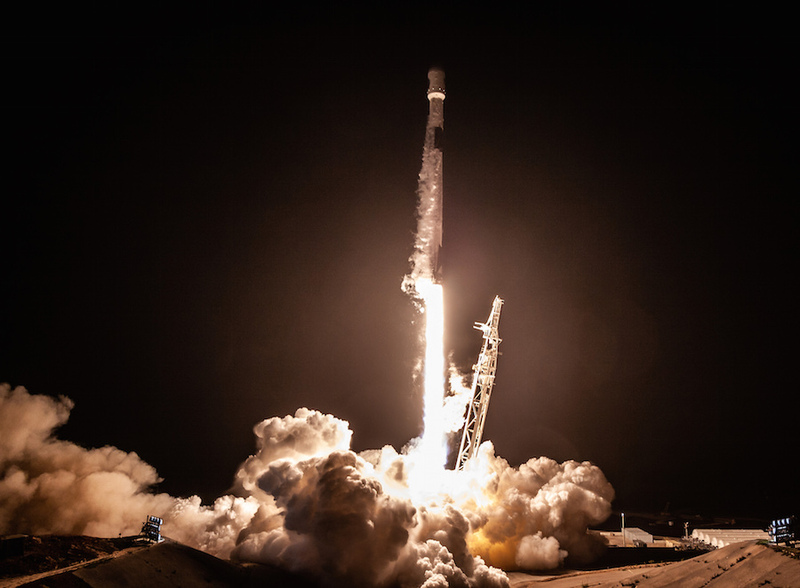 The first stage that launched and landed Sunday first flew July 25 on a previous flight from Vandenberg with 10 Iridium communications satellites. SAOCOM 1A is the first of two identical radar observation satellites developed by CONAE, Argentina’s national space agency. The final phase of construction of the SAOCOM 1B satellite has started at INVAP’s factory in Bariloche, Argentina. Its launch is planned on a Falcon 9 rocket from Vandenberg Air Force Base some time between October and December of 2019, according to Laura Frulla, principal investigator for the SAOCOM mission at CONAE. The new radar satellites will help measure soil moisture, and will watch for oil spills, floods, wildfires and other natural and human-caused disasters. The soil moisture data will provide scientists and agricultural planners information about the wetness of soil to a depth of more than 6 feet, or 2 meters, information that will help predict harvest yields, floods and droughts. “The SAOCOM mission is mainly dedicated to soil moisture, but you can identify features in urban areas, too,” Frulla said in an interview Saturday with Spaceflight Now. “The sensitivity of the instrument is quite good. We can have applications in agriculture, fishing, forestry, climate science, oceanography, natural resources, urban planning and geology. Frulla said the entire SAOCOM project, including two satellites, two launches and a ground station, cost around $600 million. The SAOCOM satellites are manufactured by a consortium of Argentine companies led by INVAP. Parts of the SAOCOM radars were produced in Italy, according to Frulla. SAOCOM 1A’s radar has a best resolution of about 10 meters, or 33 feet. The twin SAOCOM spacecraft will form a six-satellite constellation with Italy’s Cosmo-Skymed satellites. The SAOCOM satellites will fly in roughly the same orbit as the four Cosmo-Skymed spacecraft, allowing Cosmo-Skymed X-band radars and SAOCOM L-band radars to observe the same location on Earth about 10 minutes apart, Frulla said. The X-band and L-band radar bands resolve different features on Earth’s surface, with the L-band capable of penetrating into the soil to sense moisture content. 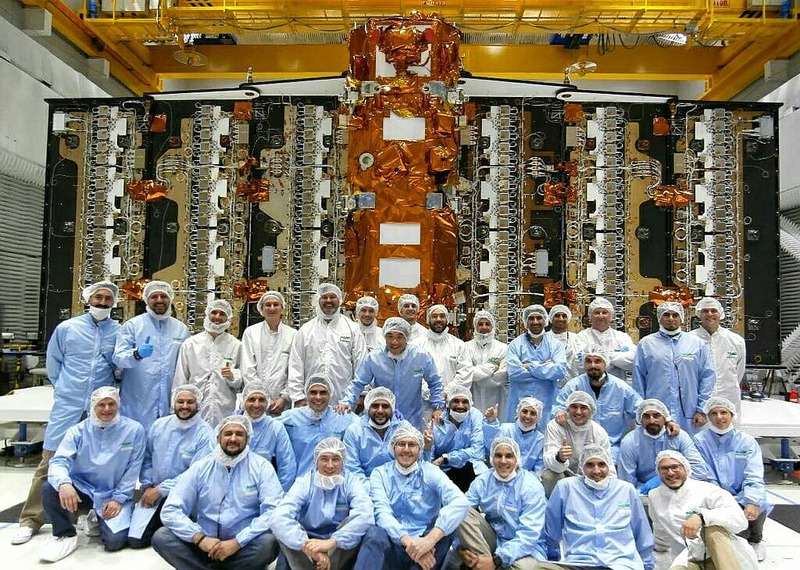 Frulla said one of the first tasks of the SAOCOM ground team is to deploy the new satellite’s radar instrument, which was folded up during launch to fit inside the Falcon 9 nose shroud. The radar imaging array will extend to a length of around 33 feet, or 10 meters, and a width of more than 11 feet, or 3.5 meters. The first images from SAOCOM 1A should be captured and downlinked around 20 days after launch, Frulla said. After a series of calibrations and testing, SAOCOM 1A should be ready for operational service by March 2019, she said. 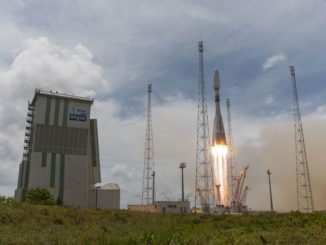 Frulla said the SAOCOM satellites are designed to operate for five-and-a-half or six years.